These pages are written to aid a true level 1 newbie who has just entered ZombieMUD for the first time in learning the initial steps to a successful Zombie experience. Before choosing Mage as your guild, you must first select a race. 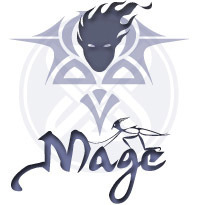 Suitable races for a newbie Mage include, but are not limited to: Sprite, Elf (can not see in dark, should remain good aligned), Sea Elf (can not see in dark, should remain good aligned) or Thrikhren. When you have chosen a race, type 'continue' to proceed. Now you must choose your guild. Type 'choose mage'. The next thing you need to do is gain a few levels with the free experience you have been given. You must advance in two places for each level you gain. You must go to the Adventurers' Guild and type advance to raise your 'adventurer level'. You can do this by going one east, one south from Buju, and typing '7 advance'. Next you much continue to the Mage guild and advance your guild levels. Go back to Buju (one north, one west) and have him transport you to the guild by typing 'transport guild'. Once you are there, type '7 advance' and you are now a level 8 mage. Now that you have a few levels, it's time to advance your knowledge in skills and spells. If you've followed the information so far, you should be standing in the Mage Guild, if not then go there now. To see what abilities are available to you, try the following commands: 'info 5', 'list spells', 'list skills'. Now lets get a spell. Of course, everyone must start out small. The more experience you gain, the better your spells will become. Skills and spells are trained at 5% increments. First read 'help spell magic missile', then study the spell to 50% by typing '10 study magic missile'. Also train the skill 'essence eye' to 20% by typing '4 train essence eye'. Read 'help skill essence eye' to see what it does. Note that depending on your race, you might not be able to study the spells or train the skills just this high due to racial limits, or you might not have enough money. But do not worry. It's time to go kill some monsters (and earn some money doing it). The 'try very slow' bit will boost your chances at the spell's success on the first cast. As you probably assumed, this slows down the speed of the spell drastically. A battle will now begin. To continue using your skill, simply type 'cast magic missile' or 'cast magic missile try <slow/very slow>' without a target. This ensures that you will not begin battle with the next monster in the room. Hopefully all goes well and your poor frog is now living in mud heaven. You will now want to give it a proper burial. To do this, type: 'dg' Type 'score' or 'exp' to see how much you have gained. Scamper around in this area killing critters untill you have gathered a nice sum of experience and cash, then head back to the Mage guild to up your spell percents. - Familiar: Will call up a small familiar to tank for you and fight as well. - Summon Familiar: To recall a living familiar to you side, should it become lost. - Power Blast: One of the most powerful spells in a mage's armoury. Its strength grows with each spell% you learn in almost any other mage spell. - Skill that saves sp: Does exactly what its name implies! - Essence eye: Allows you to see exactly when a spell will be cast. - Quick Chant: Increases the speed of your casting.